Having a good blog design is must-to-have feature which every blog should have because it is the thing which holds visitors attention toward your blog. Here is a list of some blogger templates inspired from Wordpress which any blogger can use in their blogspot blogs. This is the only paid Blogger template in this list, and I had to add it because it looks professional and will make your BlogSpot Blog look elegant. This template was released in January 2015, and it looks stunningly beautiful. This template is priced at only $21 and offers 100% support. This is a modern BlogSpot theme that is responsive, have related posts with thumbnail, Animation and is search engine friendly. 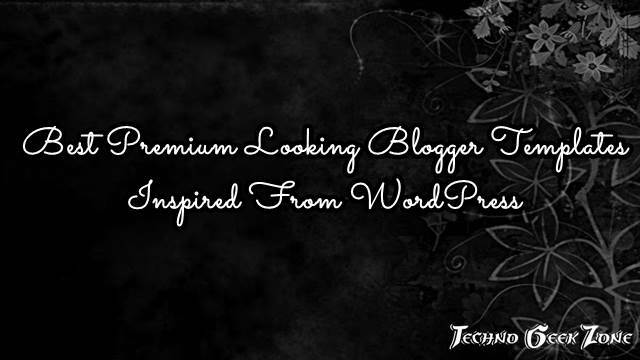 If you want to give a professional look to your BlogSpot blog, this theme is what you need. Elice a free responsive blogger template with premium features. This theme is designed by Chandeep. It’s features include beautiful opt-in form on the homepage and sidebar, clean and elegant look, SEO optimized, fast loading, threaded comment. This template is best for the blog in the blogging niche. This is sensational. This template is converted for Blogger from MyThemeShop’s premium WordPress theme. Its features are clean and responsive theme layout, flex slider, fast loading, SEO optimized, two navigation menus, page navigation and comes with threaded comments. This responsive template is converted from Genesis child theme. It also feature rich blogger template. Some of its features are responsive design, clean and elegant look, fast loading, SEO optimized, drop down navigation menus, custom email subscription widget, custom search bar, page navigation. The minimum is another blogger template designed by chandeep. It is conversion of Genesis child theme. Its features are responsive layout, fast loading, simple and clean look, custom homepage look, email subscription form, social profile on the homepage. Another Genesis child theme converted to blogger template. It is my favorite one after Elice. It also responsive and clean look template. It has some more features like grid style posts, opt-in form homepage, drop down navigation menu, threaded comments. Eleven40 is stunning responsive blogger template converted from Genesis child theme. This template has header navigation menu, custom search bar matching with the template, two column layout, three column footer, auto read more, numbered page navigation. Lummoxie is beautiful blogger template with the stylish navigation menu. Some of its features are comment count and publish date beside the post, two column layout, read more, stylish labels. Gordan is the clean template with less complexity. It you like simple templates with the elegant look then it is best suited for you. It has beautiful social buttons with the search bar. It has two column layout, auto read more and beautiful post teasers. You are not able to upload your own themes and pug-ins. In addition, WordPress.com will not allow you to post Google AdSense ads or affiliate links. However, WordPress may on occasion show Google text ads on your site. how to change router password It is always recommended for the users to change the default router admin password after the initial router setup. In this post, we have come up with a detailed guide on how to change the wireless router’s default password easily.